How Many Treatments To Remove My Tattoo? Laser tattoo removal is different for each client because every person and their tattoo is unique. Because of this, it is not possible to predict the exact number of treatments that a given tattoo will require for complete removal. If anyone claims otherwise, they are simply not being truthful! Most professional tattoos take around 4 to 12 sessions to completely remove — sometimes less, occasionally more. The reason for the broad range is that there are a lot of factors to take into consideration. Skin type – lighter skin or darker skin. Depth of tattoo – was the tattoo touched up or covered up? Location on the body – closer to your heart is better due to blood circulation. Ink colors – darker colors are generally easier to remove. Amount of ink – how hard did the artist press down to apply the ink and how much ink did they use? The type of ink applied – professional ink or homemade? Scarring from the tattoo process – is your tattoo raised and scarred? Immune system – are you fit and healthy? Tobacco use – is your immune system already clearing out other particles? Aftercare – did you follow your aftercare instructions? Laser technology used – Is it the best of 2017? We understand you want your tattoo removed as quickly as possible. The faster our clients see fading, the more satisfied they will be, and most of our new clients are recommended by former clients! Each time you visit our clinic, we treat your tattoo with as much energy as is safe for you! At LaserAll we are the tattoo removal experts. 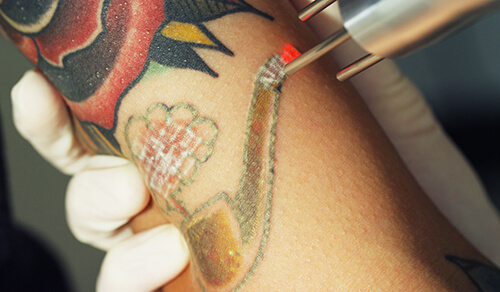 We offer free consultations and will happily answer any questions have about laser tattoo removal.